A hands-on guide to reading and writing for students at any skill level. PACKAGE THIS TITLE WITH OUR 2016 MLA SUPPLEMENT, Documenting Sources in MLA Style (package ISBN-13: 9781318084479). Get the most recent updates on MLA citation in a convenient, 40-page resource based on The MLA Handbook, 8th Edition, with plenty of models. Browse our catalog or contact your representative for a full listing of updated titles and packages, or to request a custom ISBN. Choices equips beginning writers with the skills and confidence to produce writing that matters. Kate Mangelsdorf and Evelyn Posey draw on over 40 years of combined classroom experience to ease students into the writing process through accessible and supportive writing instruction, encouraging students to actively participate in each step of the writing process. Along the way, students discover for themselves how to transform their brainstorming to discovery drafts and revised essays. Incorporating suggestions from developmental writing instructors across the country, the sixth edition emphasizes the connection between reading and writing. A diverse collection of student and professional essays support the text’s focus on reading well to write well while a new chapter, Reading to Improve Writing, expands the coverage on active and critical reading and offers guidance on tools and strategies for pre-reading, reading, and reflecting. This all-in-one writing guide, reader, research text, and handbook empowers students to become effective academic writers—all at an affordable price. To support students at all levels of writing, Choices can now be packaged with free access to LaunchPad Solo for Readers and Writers, a robust media package that brings together video tutorials, interactive grammar quizzes, and valuable writing instruction and gives students the practice to master the skills they need to succeed. 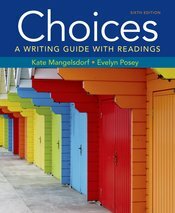 Use ISBN 1-319-03958-8 to order Choices and LaunchPad Solo for Readers and Writers.